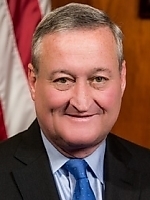 " A life-long resident of South Philadelphia, Jim Kenney is the son of a Philadelphia fire chief and a working mother. First elected to the Philadelphia City Council in 1991, he is currently in his fourth term of office as a Democratic Councilman-at-Large. He was the highest vote-getter in both the 1999 and 2003 general council-at-large elections." "Kenney is a 1976 graduate of St. Joseph's Preparatory School, and worked his way through LaSalle University, where he majored in political science. Kenney and his wife Maureen are the proud parents of two children, Brendan and Nora." PA State Senate 01 - D Primary - Apr 22, 2008 D Lawrence M. "Larry" Farnese Jr.